In 1960 the society began publishing its award winning journal, Faulkner Facts and Fiddlings. The twice yearly publication includes narratives, poems, photos, and articles by historians and county citizens concerning county pre-history, history and culture. 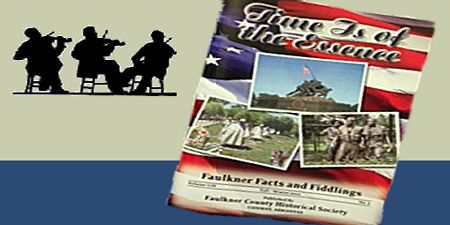 Current and past issues of Faulkner Facts and Fiddlings are available at the Faulkner County Museum and the Faulkner County Library at a cost of $4 each. Journal editor Vivian Lawson Hogue welcomes submissions for possible publication in the Faulkner Facts and Fiddlings. Stories may be about people, places, events, businesses, organizations and other historical subjects specific to Faulkner County. Please READ the journal standards and guidelines, then e-mail faulknercountyhistory[at]gmail[dot]com with your submission. * Use Adobe Acrobat Reader, free software program for viewing and printing PDF documents. Interested in Faulkner County's Past?